Happy National Tequila Day, detailers! Why toss back a plain, old tequila shot when you can shoot a mini-margarita instead? In celebration of the boozy beverage, I’m sharing with all of you an awesome recipe that is great for engagement | bridal showers & bachelor[ette] parties, as well as wedding receptions alike! I have a special treat I’m sharing today in celebration of this holiday, & it is something that I have personally gotten the chance to witness and enjoy myself! My sister & brother-in-law are not cake people in any way, shape or form, so they swapped out the traditional cake-cutting for ice cream-scooping, and had Baskin Robbins cater their dessert! It was the perfect addition to their reception, not just for that particularly scorching-hot, early fall day, but for these two foodies that wanted to make sure every aspect of their wedding day was uniquely them! For those days where it is just a little too hot to be in a full ballgown and 3-piece suit, for the mint-to-be couples that like a lot of different dessert options, and every little reason in between, consider cooling off with a ice cream bar! Happy National Hawaii Day, lovelies! 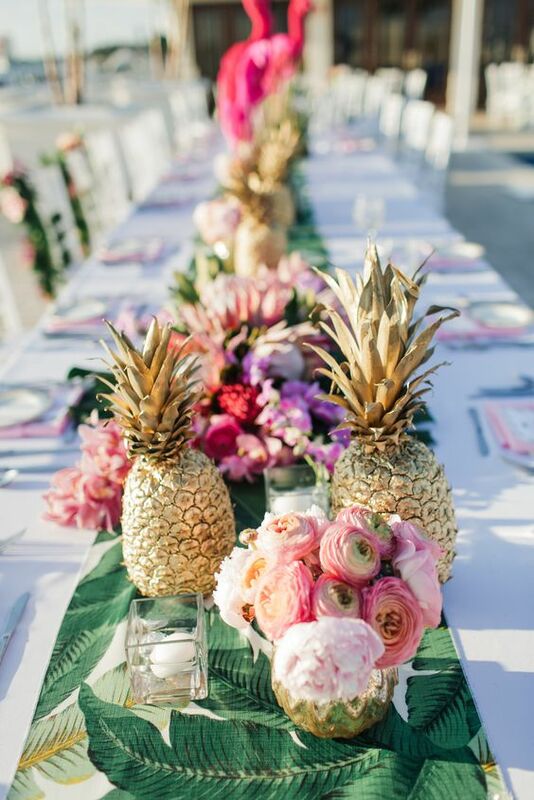 In honor of this beautiful island paradise, I wanted to dedicate a post to all things tropical, and what you can expect when making this tropical destination the location of your big day!